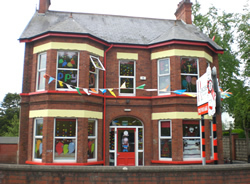 A part of the Stormont landscape since 2001, with an unrivalled reputation as East Belfast's premier childcare setting. Just across the road from the Stormont estate, this beautifully converted house is now a perfect home from home for children form 6 weeks to pre-school. Extensive outdoor facilities mean that outdoor and indoor fun is the norm at Rascals. We are delighted that this is a very busy branch, and if you wish your child to experience all that this nursery has to offer, you should book a viewing today.